'Gloss' refers to how shiny and light-reflective a glaze is. Glazes high in glass former (SiO2, B2O3) are glossy. Those high in Al2O3 tend to be matte. Fluid glazes can crystallize to a matte surface if cooled slowly or a glossy surface if cooled quickly. The SiO2:Al2O3 ratio is taken as a general indicator of glaze gloss, ratios of more than 8:1 are likely to be glossy. In some industries, gloss is a more of a product of firing than chemistry. For example, a glaze may normally fire matte (by having a chemistry that crystallizes heavily on cooling, for example), but when super-cooled it will fire glossy. A secret to an ultra clear at low fire. Magnesia-alkali, low Si:Al ratio, more boron. 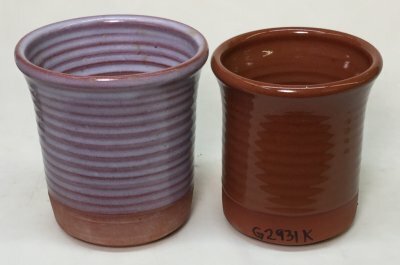 On the left is G2931J, a zinc alkali fluxed and high Si:Al ratio glaze. Those look like micro-bubbles but they are much more likely to be micro-crystals. High-zinc and high-silica is the mechanism for crystalline glazes, so it appears that is what they are. G2931K on the right has much more boron, double the Al2O3, less SiO2 and is magnesia-alkali instead of zinc-alkali. It is the product of dozens of tests to find an ultra-clear having a glassy smooth surface. This particular chemistry, although having only a 6:1 SiO2:Al2O3 ratio is ultra-gloss. In addition is has low expansion, will fast fire and the boron is not high enough to compromise the hardness. A transcript of a presentation at the 3rd Whitewares conference at Alfred University in the spring of 2000 by Richard Eppler.